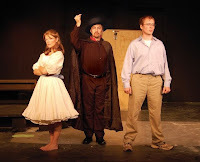 The Town and Gown Players present the musical "The Fantasticks" this weekend (June 13-15) and next Thursday through Sunday (June 19-22) in conjunction with AthFest. It's a story of two neighbors using reverse psychology in an attempt to arrange a marriage between their children. They stage a feud and forbid the boy and girl from seeing each other, expecting them to rebel. The trick works and the two do fall in love, but that only lasts until they discover the plot. They set out in the world to live their own separate lives, but they come together again after realizing that time is the "most stringent teacher." Director Julie Ramsey says, "This show is a classic. It has everything: wit, love, swords, slaps, and kisses!" Shows are at 8 p.m. except for Sunday matinees at 2 p.m. There will be a reception after the show on opening night. General admission is $18, and admission for students, seniors, and members is $15. The Thursday show is a bargain price of $5, and admission with an AthFest wristband is $5. You can make reservations by calling (706) 208-8696. Why isn't The Human Torch in that picture?